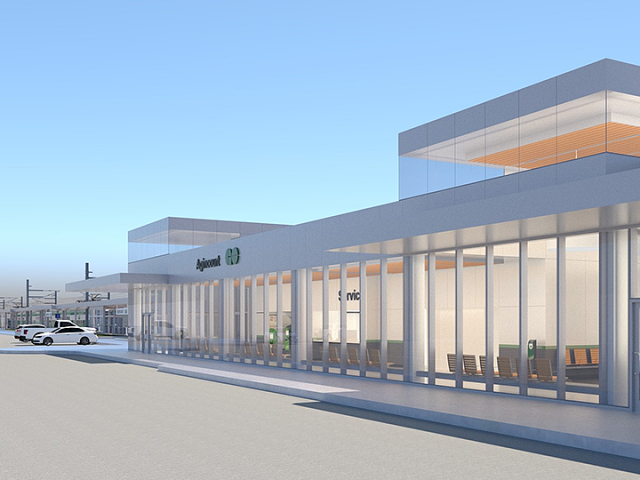 Infrastructure Ontario (IO) and Metrolinx have awarded a fixed-price contract of $254.5 million to EllisDonTransit Infrastructure (EDTI) to design, build and finance infrastructure upgrades for three stations on GO Transit’s Stouffville line. The consortium will also build a grade separation—an overpass—to carry GO trains across Steeles Avenue East. 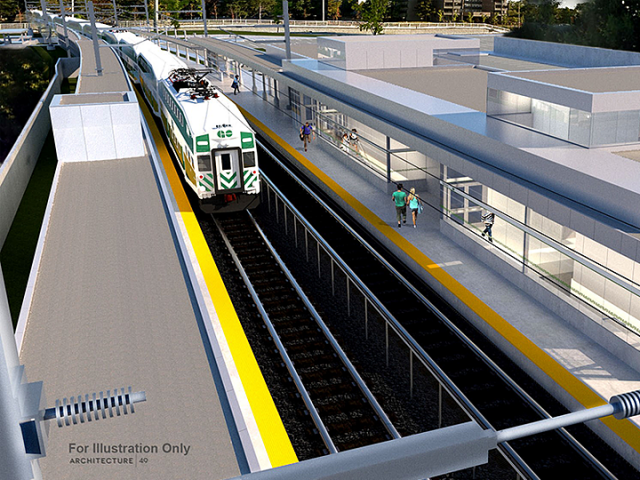 Unionville Station will see a new second track and a third turning track, new side platforms with a canopy enclosure, passenger access tunnels with elevators and other passenger amenities. EDTI will also expand parking facilities at the station. 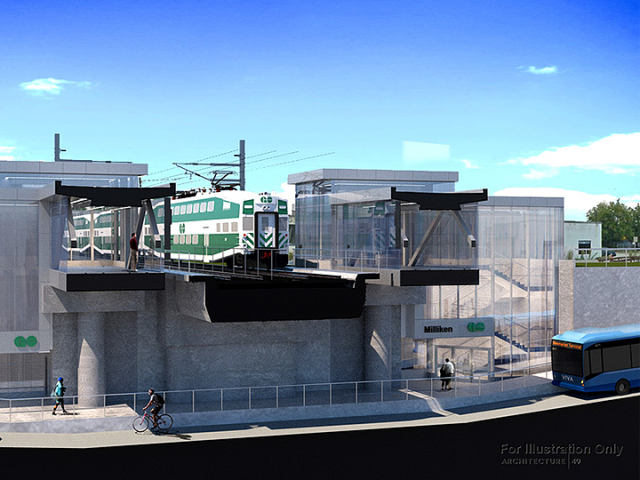 At Milliken Station, the team will build a new east-side platform and upgrade the west-side platform with a full enclosure, install new passenger access tunnels connecting the platforms with elevators and build a new pedestrian connection to Steeles East and other passenger amenities. The contractors will also install a new second track at Agincourt Station and build new side platforms with a full enclosure, passenger-access tunnels with elevators and passenger amenities, including a new waiting area. They’ll also relocate the station building. EDTI consists of: developer EllisDon Capital Inc.; constructor EllisDon Civil Inc.; architects: Architecture 49; designers WSP / MMM; and financial advisor EllisDon Capital Inc. The group starts design this month and construction this September. It expects to substantially complete the project by December 2020. In July, 2016, IO and Metrolinx issued a request for qualifications as the first step in the process to select a team to deliver the project. In September of that year, the two provincial agencies invited three shortlisted groups to respond to a request for proposals. They selected the teams using a number of criteria, including design and construction capability, experience and financial capacity to deliver a project of this size and complexity. Kiewit-Bird Joint Venture: developer and constructor Peter Kiewit Infrastructure Co. and Bird Design-Build Construction; designers Stantec and Perkins + Will; and financial advisors TD Securities, Kiewit Canada Development Corp. and Bird Capital Limited Partnership. A fairness monitor oversaw the entire procurement process. Infrastructure Ontario, Metrolinx and their contractor are delivering the project using IO’s alternative financing and procurement model (AFP). According to IO, the “AFP model is an innovative way of financing and procuring large public infrastructure projects”. AFP uses private-sector resources and expertise, and transfers project risks to those private-sector teams, which are accountable for delivering the project on time and on budget. By upgrading the stations and building a grade separation at Steeles Avenue, Metrolinx continues to work toward developing regional express rail service—frequent, two-way, all-day service along the Stouffville line and other GO rail corridors. Recently, Metrolinx announced that trains would likely operate express along this part of the line south of Unionville, which likely requires it to build those turning tracks at that station. Unionville is also the terminus for the City of Toronto‘s frequent SmartTrack service along the same corridor.